Bring a large amount of salted water to the boil. Add the pasta and cook according to packet instructions. Cut the broccoli into small florest and place in a large bowl with a little water and a pinch of salt. Cover with cling film and cook in the microwave for about 3 minutes on full power. Drain the capers and roughly chop. Drain the anchovies, rinse with water and dry. After cooking, drain the pasta and rinse with a little water. 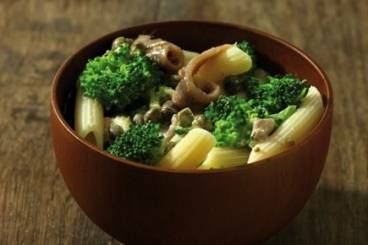 In a large bowl mix the capers, anchovies, broccoli pieces, cream and olive oil and top with some grated parmesan. Pour the pasta into the sauce and serve whilst still hot.